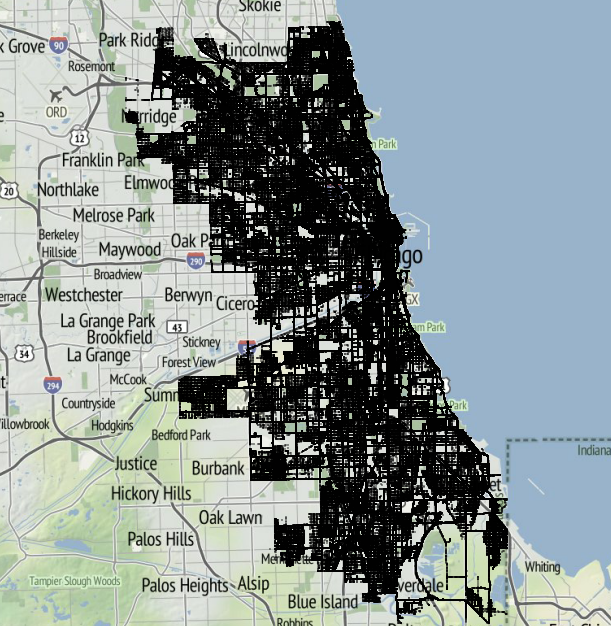 Since January 2012, we've tracked and archived plow activity for 54 snow events in Chicago. You can download the raw data from past storms here. We make these points available in a SQLite3 database. The easiest way to work with this data is to run the points through our write_gpx_all.py script to generate a set of GPX files (one for each plow). From there, you can import it into QGIS or write a script to analyze it. Please note: Sometimes our data feed breaks while collecting plow locations from the City of Chicago Plow Tracker. This means that some of our data has gaps in it for periods of time. Jan 31 - Feb 8, 2015 19.3" SQLite This was Chicago's 5th largest snow storm on record. Plows were tracked for 9 days and we collected 1.94 million GPS observations of Chicago snow plows. Missing data from 10pm Feb 2nd to 8am Feb 3rd. Jan 21, 2012 (part 1) 9" Split in to two Fusion Tables.